An early spring night in 1999 found Sarah and me on our first date in a pretty area of Minneapolis called St. Anthony. 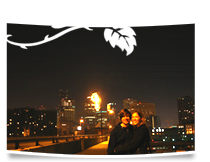 We walked along the Central Avenue Bridge that overlooks the Mississippi and affords a dazzling view of the city. At one of the overlooks I spotted a beer bottle and, being a foolhardy teenager, threw the bottle over the bridge, smashing it into a thousand pieces on the ground below while I yelled into the night. How that spectacle didn’t scare Sarah off is beyond me. Fast forward to 2005. In March Sarah and I were having a typical conversation. It was typical in that it started with Sarah asking me one of a number of questions, including but not limited to: “When are you going to propose to me?”, “Don’t you think it’d be fun to be married?”, “So… how are you going to pop the question?”, etc. These talks usually ended in tears… mine not hers. This particular night I let it slip that I didn’t want to propose to her there in Colorado, I wanted to do it in Minneapolis. She started looking at flights the next day. I was all set for April 15th to be the big day (I suppose I chose that day to lighten the tax blues). With about a week to go I called to ask Sarah’s parents if they’d like to come out to dinner with me. They assented, and so on Proposal Eve we went to a Jewish deli to talk (fitting, if you know the Yasgers). I meant to ask them, “Can I marry your daughter?” but before I could get the whole question out Barb gushed, “Yes!!! Of course!” Well that settled that. The only problem arose when I casually asked them to keep this meeting on the down low. “About that…” said Jim, “I kinda told her we were going out to eat with you tonight.” There went the element of surprise! Undeterred, I picked up the ring the next day, swung by to pick up the girl, and headed downtown for a “date night”. 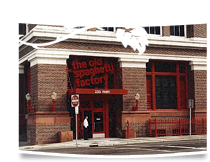 We arrived at The Old Spaghetti Factory (I spare no expenses) and found there was a 45 minute wait. How in the world will we beguile the time, we thought. I ordered a bottle of wine. This ended up being a good move because up to that point Sarah was, I must admit, less than impressed with my “plan” for the evening. I had more in store, she just didn’t know it. She suggested that after the meal we take a little walk down to St. Anthony. It was all I could do to keep the wine from coming out my nose. That was my exact plan and she was walking straight into it! I calmly replied, “Sure, if that’s what you want to do.” I was getting a little shaky though, and, next thing I knew, I clumsily knocked over the bottle and Sarah’s glass. I went to grab some napkins while Sarah clutched what remained of our drinks. Not five seconds later our table was announced. The meal was great, lightened by my previous bungling move and the taste of mizithra cheese (if you haven’t tried it I suggest you do). We talked about being back in Minneapolis, seeing friends, and there was very little of Sarah’s crusading for Denver. At one point I excused myself to the restroom where I called my friend Andy to make ready the preparations. Dinner being done, we left the restaurant to take our walk down St. Anthony. Things were going swimmingly until halfway to our bridge it started to sprinkle. Sarah was adamant we go back and take the car, but I had none of it. I insisted we foot it. Sarah was getting a little weirded out, but hey, I wanted to do it the right way. Luckily for us the light rain stopped as we neared the bridge. We came to it and I insisted we cross the street for a better view. Sarah suddenly recalled our first walk down the bridge and the incident with the bottle. I pretended one of those “Oh yeah… I think I do recall that,” kind of responses, inwardly surprised at how perfectly this was turning out. We stopped a few times to look over the river. When we got to an enclave I spotted an empty beer bottle (one of many planted along the way by Andy) and exclaimed, “Hey, what’s that?” I took it and smashed it on the ground. Sarah started laughing and looked over the river. When she turned back she found me kneeling in the midst of the broken glass with my arm outstretched and a ring in my hand. “Love you… beautiful… wife…” were the only things she heard me stammer. Her response was a little disappointing. “No, get out of that mess!” She was still laughing. She grabbed me and hugged me tightly as I kept asking her to marry me. She said, “Sure, ok.” “So is that a yes?” “Yes, John,” she said, “Of course I’ll marry you!” We hugged and laughed. It was beautiful.